Imagine having to sit in Thursday’s 10-hour Benghazi hearing before a House committee. Well, then imagine having to come up with jokes at the last minute for a nightly talk show the same day. 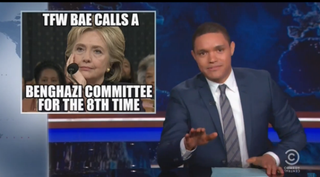 But in the world of The Daily Show, anything is possible, and Trevor Noah definitely had a lot of ground to cover. Right off the bat, Noah opened his monologue with a joke about the absurdity of the hearing. Noah also poked fun at the length of time the hearing lasted and compared it to actually binging on a Netflix series, but more boring. He referred to it as “Binge-gazi.” From there, he joked about how everyone on the committee could be compared to movie villains, hence the Netflix reference. The pièce de résistance came when Noah joked about Rep. Kevin McCarthy and how he seemingly admitted that he wanted to pull down Clinton’s poll numbers. “Ahhhh! McCarthy! You just admitted to convening the committee to hurt Hillary Clinton. Classic supervillain mistake. You have to wait until your enemy is dead before you reveal the plot!” Noah joked.